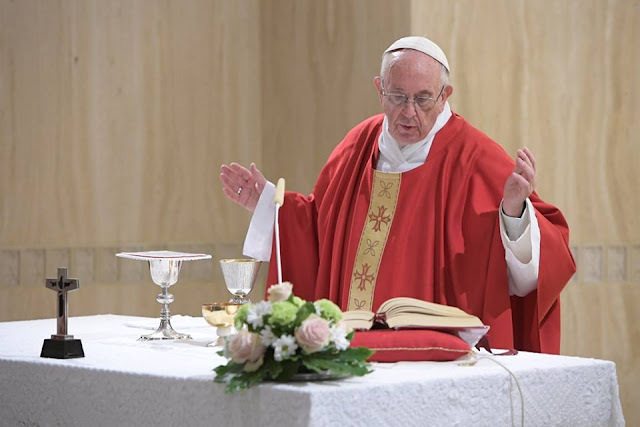 Vatican Radio-Pope Francis on Friday suggested watchfulness, service and gratuitousness as three attitudes that can help us keep clean the temple of the Holy Spirit. He made the exhortation in his homily at the morning Mass in the chapel of the Vatican’s Casa Santa Marta residence. The Pope was reflecting on the first reading from the Book of the Maccabees where Judas and his brothers were re-consacrating the temple desecrated by the pagans, and the Gospel reading where Jesus was driving out merchants from the temple, that was transformed into a den of thieves. The Pope pointed out that the most important temple of God is our heart, where the Holy Spirit dwells. The Holy Father asked whether we keep watch over this interior temple, and are careful about what happens in the heart, who comes in and who goes out, the feelings, the ideas... “Do we talk to the Holy Spirit and listen to Him?” the Pope asked and urged all to keep watch over what happens within. The Pope then spoke about how gratuitousness, the third attitude, helps in keeping the temple clean. He wondered, “How many times we sadly enter a temple – a parish, a bishop’s house and so on, not knowing whether were are in the house of God or in a supermarket.” “There we have business, including the price list for the sacraments – nothing is free!” But the Pope argued that God saved us freely, without making us pay.